The potholders for the 2013 swap (on Ravelry, on Flickr) are done! 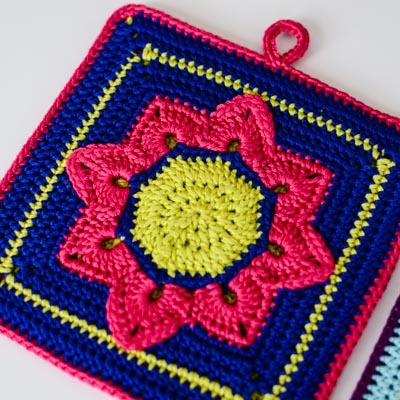 Pattern: Eight Pointed Flower by Julie Yeager. With the addition of a few more rounds, my potholders came out to be exactly 6″ square. The back was an improvised pattern, crocheted with improvised colors (similar, but not the same, if I had run out). At first I was slightly bothered that the backs weren’t all the same, but then realized that each potholder will go to a different recipient, so this picture is the only time the three of them will be seen as a group. So, I got over it. Yarn: Tahki Cotton Classic, 100% mercerized cotton. I didn’t keep track of the colors I used, sorry. Crochet hook: size C (2.5 mm) from this set, which is still my favorite. I loved this clever, clever pattern and look forward to exploring other patterns by Julie Yeager for future potholders/blanket squares. P.S. If you’re interested in a trip down memory lane, here are the potholders I crocheted in 2009, 2010, 2011, and the ones I received in 2009, 2010, 2011. Showing the years of potholders, both crocheted by you and received by others was nice to review. Good idea. Your little “guy” is so sweet, more photos are always welcome. Very precise work – as usual. It’s interesting how different color combinations can make the same pattern look quite different. That is a great pattern and I really like your color combinations. I participated in the swap one year, but won’t again. I don’t think my potholders were of the same caliber as yours, and I really just got too anxious trying to pick out the right pattern. Sigh… I know, right? With all that one could get worked up about, I channeled my anxiety into potholders. I need to block mine and shove them in the mail. Yours are lovely. Maybe I’ll be lucky and get one!